During the recent Microsoft Partner Conference, slides were presented at a session to service providers comparing the costs of hosting with vSphere versus Hyper-V. These slides eventually made their way to the public and got picked up by the press. However, the information presented was fundamentally incorrect. Based on the slides that became public, it is clear that Microsoft is continuing their quest to distract customers from their lack of available product with an easy tagline to remember: “Microsoft is 1/3rd 1/5th 1/6th 1/4th the cost of VMware”. Too bad none of these claims ever stand up to scrutiny. It is also clear from the slides that Microsoft has not figured out the difference between vSphere pricing and the VMware Service Provider Program (VSPP) pricing as they are quite different. Besides these obvious errors, the comparisons are simply useless because they are essentially trying to compare the cost of apples to the cost of fruit baskets. Let’s start with the first slide regarding the total cost of ownership (see here). The slide is supposed to portray how the vCloud Premier bundle is 4 times the cost of Microsoft’s Service Provider program. But what exactly is included in the Microsoft program as depicted? Licenses for Windows Server Datacenter Edition and System Center Server Management Suite. What is included in the vCloud Premier Service Provider bundle? It is always difficult to perfectly line up different vendors’ product offerings, so let’s look at it piece-by-piece based on the features and capabilities that a service provider wants and benefits from, starting with the virtualization platform. The foundation for cloud computing is the virtualization platform. For service providers who need rock hard stability and reliability, the choice in platform is vital to the success of the rest of the solution. That is why the Premier bundle includes the Enterprise Plus edition of vSphere 5 that carries all of the most advanced features of virtualization. These unique features to Enterprise Plus are unmatched by any other virtualization vendor. vSphere remains the only virtualization solution able to deliver live storage migration without any downtime, saving SPs from application downtime for storage maintenance. That technology has been further enhanced to enable Storage DRS – automated load balancing of VM files among storage arrays, which further improves storage efficiency. And, to simplify how storage is managed, VMware Profile-Driven storage allows SPs to streamline storage provisioning and save on both capex and opex by optimizing VM placement across the tiers of storage pools. With Auto Deploy, SPs can deploy bare metal vSphere hosts “on the fly” saving hours in provisioning time. Once the environment is up and running, Auto Deploy also helps cut down on patching time by pushing out updated images rather than scheduling patch windows. In comparison, Microsoft’s System Center Virtual Machine Manager Self Service Portal (SCVMM SSP) lacks the capabilities necessary for building cloud environments such as – support for multi-tenancy on shared infrastructure, automated resource provisioning, and application catalogs. An integrated chargeback solution is necessary for SPs to accurately track and charge their end customers. VMware vCenter Chargeback is a fully-integrated chargeback solution that can track costs for power, cooling, real estate, software licenses, and maintenance, while allowing the service providers to customize and configure costs for their business model. Designed specifically for vSphere and vCloud Director, vCenter Chargeback can meter resources like broadband network traffic, public IP addresses, and other services (e.g. DHCP, NAT, firewall) in addition to standard CPU, memory, and storage metering. vCenter Chargeback is included in both the Standard and Premium bundles. Microsoft does not have a chargeback solution. Service providers are left with developing their own solutions or purchasing tools from 3rd party vendors. One of the main concerns of cloud computing is security. VMware revolutionized virtualization security with the introduction of the vShield family of products – a leading virtualization-aware security solution designed specifically for vSphere. Service providers can utilize the perimeter protection, port-level firewall, and NAT and DHCP services that are built directly into vCloud Director as part of the Standard bundle. With the Premier bundle, SPs get upgraded to the full vShield Edge suite that adds site-to-site VPN and load balancing. Microsoft does not offer a comparable security solution to protect virtualized infrastructure, relying on traditional physical security solutions that come at an extra cost to service providers. Lastly, the VSPP bundles include Production Support and Subscription (SnS) to provide SPs the confidence that VMware is ready to help. Production SnS provides global 24×7 support with fast response times and unlimited support requests. SPs also have access to all product updates and upgrades during the active terms of the contract. Going back to Microsoft’s cost comparison, it is more representative to look at the Standard bundle even though there is still a huge feature mismatch. Microsoft does not publish their SPLA pricing so we will use the figures and configurations from their slide. SPLA licensing is per processor while VSPP licensing is per GB of reserved virtual RAM. The VSPP pricing shown below is based on list price for the Standard bundle and assumes that 100% of the virtual memory is reserved. With VSPP however, service providers can choose to optimize their resources by reserving less so calculations are shown for pricing at 80% reservation and the minimum of 50% reservation. Additionally, this VSPP pricing does not take into account discounts offered when providers commit to a minimum monthly usage level. Under VSPP, service providers are only charged for powered-on VMs so although a provider maybe charging end users a flat monthly rate for resources regardless of usage, VMware does not charge the provider until a VM is powered-on. Since the SPLA licensing is per processor, the service provider does not get this benefit. 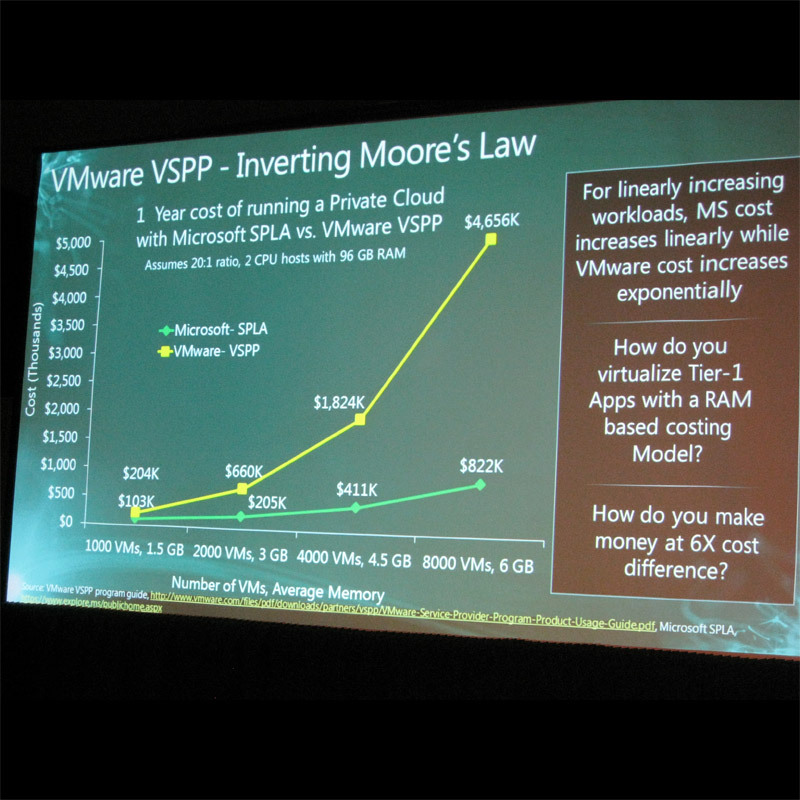 Microsoft makes further claims in this slide here that VSPP pricing rises exponentially while SPLA rises linearly. Microsoft is again trying to fool customers by increasing the VM count while also increasing the size of the VMs. Based on the same size VM, VSPP pricing increases linearly as the VM count rises. Based on this configuration under VSPP, a service provider could deploy at least another 200 VMs on the same hardware. Don’t be fooled by Microsoft’s latest claims. The vCloud Service Provider bundles are feature rich offerings designed to include all the necessary components for building a true cloud service. With VSPP you get the entire fruit basket and not just a bad apple. Microsoft is not even close to offering the core virtualization platform, cloud provisioning, chargeback, security, and support capabilities offered through VSPP. Additionally, VMware gives service providers access to over 250,000 customers who have already built their infrastructure on compatible VMware technology. This entry was posted in Uncategorized on July 20, 2011 by Theresa. It is absolutely 100% none of VMware’s business how much money/value I am able to gain by using their tool. Does Snap-On charge based on perceived value the end user receives? What about electric companies, b/c I buy “x” kilowatts per month I am able to generate “x” amount of revenue, so hence I should be charged “x” amount of thatI revenue? I really hope VMware is hearing what we are all saying, otherwise, I am sure that once contracts end, there will be migrations. What VMware fails to mention is that we still need Microsoft licenses for this. That is Microsofts big win over VMware. So, for the same solution running Windows, we could either license each VM seperatly or use datacenter edition for all the hosts. That would make VMwares calculations with 100% reservation exceed $340.000, three times the Microsoft solution. I know you’re looking for ANY reason to divert attention from the vsphere 5 Licensing Disaster, but this article isn’t going to do it. Can we just call a spade a spade? The vsphere 5 licensing change is a plain money grab/screw customers by VMware and you guys are pitching this as good for me. STOP INSULTING MY INTELLIGENCE. THIS IS HOW YOU TREAT US? If you think about what you’re saying, the guidance vmware has been giving their customers for years and how vmware is marketed you realize just how ridiculous, misguided and insulting this licensing is to customers. VMware says the new VTAX/Memory Tax is “really not that bad.” This is simply not true. Read your own forums. We’ve done the math and we’re going to see just over a 300% increase. 300%. My boss is pissed beyond words. Vmware states “Vsphere 5 for desktops is great for VDI.” Haven’t looked and don’t even care. The last thing we’re going to do is even consider VMware for VDI (or anything else) after this. NOT A CHANCE. We’re not going to take the chance of deploying vmware for VDI only to have you jack up the price the next time around. VMware says: “Hardware constraints have been removed.” This is a shell game. No, you have replaced one dumb constraint that you created with a new worse constraint and you’re telling us this is good for us. SERIOUSLY, DO YOU THINK WE’RE STUPID? I loathe writing in all caps, but considering there are 50 pages in the forums that are saying the same exact thing (which you are ignoring), maybe this will get someone’s attention. VMware says: “This new licensing is great for cloud computing.” If this new licensing is a step toward cloud computing, we’re in big trouble. Virtualization has been helping us save money. We run more apps on fewer servers. You’re now saying that’s not true anymore. The more apps, the more it costs. Say again? Why am I moving to the cloud? This contradicts everything vmware has said for years. VMware says: “Scale out over Scale Up.” I’ve been advocating scale out over scale up, but vmware has been telling us FOR YEARS to scale up so we the followed the guidance. That’s what we’ve been doing. Now you’re screwing us for FOLLOWING YOUR GUIDANCE. VMware says: “Enforce customers to better right size.” Isn’t virtualization supposed to help me with this? Aren’t all your memory optimizations supposed to do this for me? Oh thats right, now you’re penalizing me for this fact. BTW, thanks for calling us stupid and demanding more money. We, your customers, love that. We don’t know any better. Perhaps you’d like to kick my dog too. Finally, you raised the price from ESX 3->ESX 4->ESX 5. Don’t think we haven’t noticed. This is the last straw and we’re getting off this carousel. VMware doesn’t give a crap about their customers in the slightest and we’re done. Even this “explanation” is a clear commercial for MS the way I read it. So the cost starts at $17.000 more than Microsoft and then rises to more than double the cost of Microsoft? And then it doesn’t even include the Microsoft licenses? I’m not a Microsoft fan at all, but who is VMware trying to fool here? I have to agree with drew, buying tools from a company does not give that company any right to ask or obtain information on what your using the tools for. Having a site-to-site VPN would really make a huge difference when it comes to security. With VSPP you get the entire fruit basket and not just a bad apple. VSPP however, service providers can choose to optimize their resources by reserving less so calculations are shown for pricing at 80% reservation.